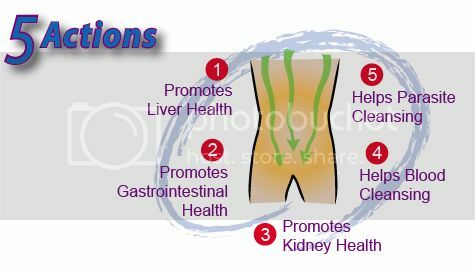 Our body has a natural detoxification system (liver, colon, kidneys, gallbladder, lungs, skin, lymph and blood) to eliminate toxins on its own. Unfortunately, we are now exposed to more toxins than ever before in our environment. Studies have shown that toxic substances come from everyday subtle sources such as drinking water, food additives, processed food and etc. A build-up of toxins overloads our detoxification organs, in particular our liver and colon. When the liver is unable to cope with the excess amount of toxins, they are re-circulated back into our body system via the lymphatic and blood circulation. Often, these toxins accumulate in our cells (especially fat cells), tissues, blood, organs (such as the colon, liver and brain) and remain stored for years, leading to all kinds of health problems. Signs of toxicity include headaches, tiredness, sluggishness, mood swings and even aches and pains. Therefore, a regular detoxification routine (eg. 2-3 times a week) is recommended to flush out waste and toxins before they start to accumulate to unhealthy levels. Introducing TruDtox which was introduced by Miss Betsy from LiveLife. 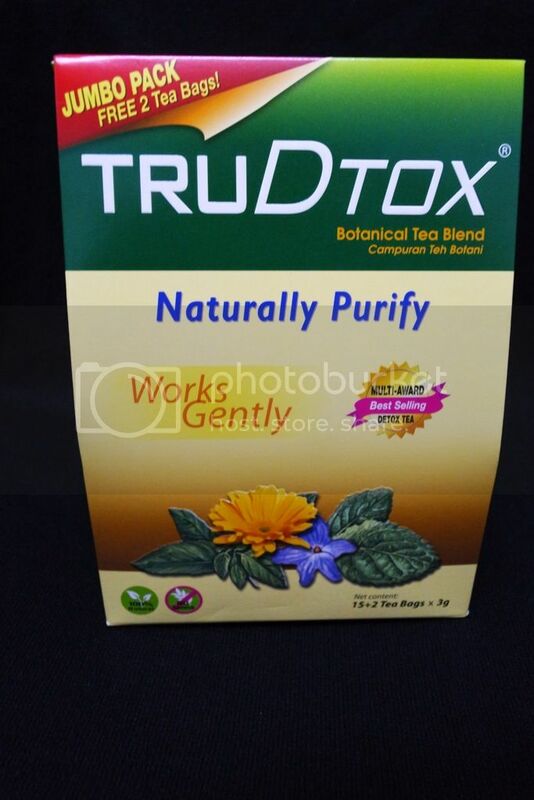 For your information, TruDtox™ is a Swiss natural and organic botanical tea that works gently to cleanse and help strengthen our body's own natural detox organs. It is made of 100% organically-cultivated herbs, flora and teas that are traditionally known to help our body detoxify. TruDtox™ does not contain harsh laxatives and as such will not create bowel dependency. TruDtox™ is formulated for safe, gentle and regular use. Each box comes with 15 tea bags and addtional 2 tea bags. 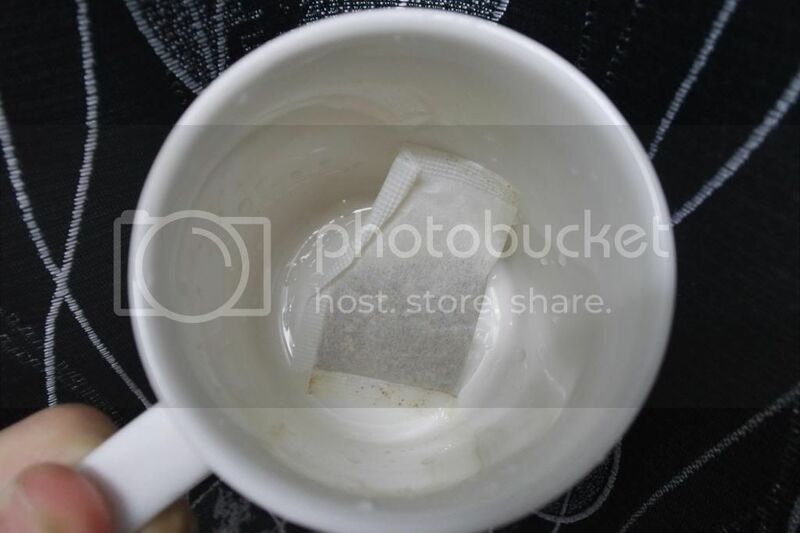 The packaging of the 1 tea bag. One teabag a day or as and when needed. 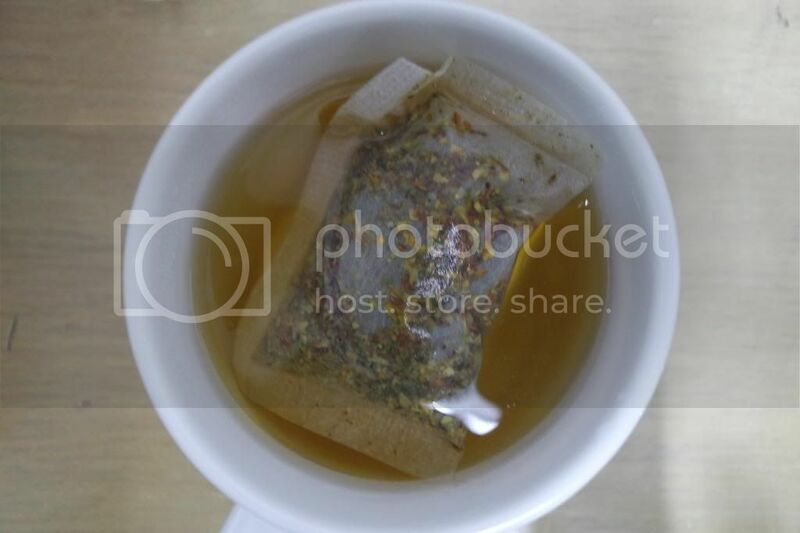 Brew teabag in a cup of hot, boiling water for 20-30 minutes before serving. One tea bag can be drunk a few rounds in case the colour of the tea is still dark. You can opt for bigger mug to brew the tea bag. Soak it for 10 - 20 minutes before serving. I always wanted to go for gentle detoxification. This would be my second time trying out detox tea. 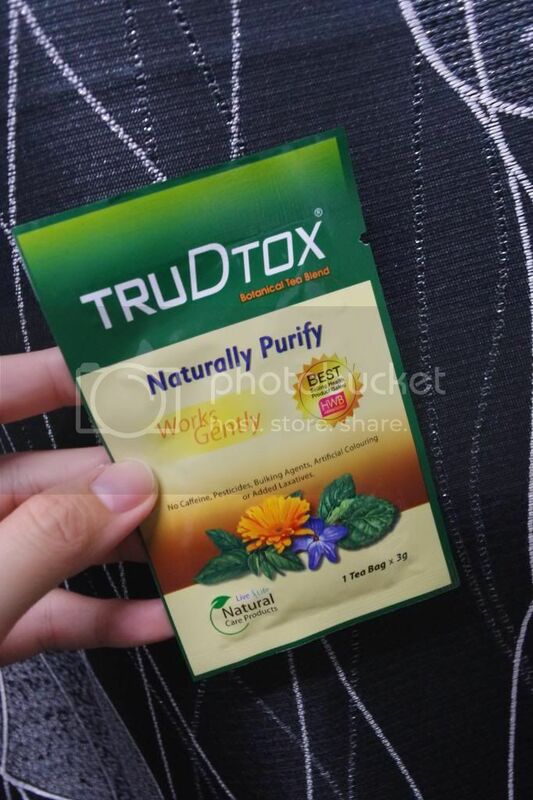 Previously I tried the detox tea from other brand and it worked slightly different from TruDtox™ tea. The one I had tried previously gave me a bad experience because the ache came the whole night after consuming the tea during dinner time. However, this TruDtox™ tea made me feel a minor urge of bowel movement only. It started its effect after approximately 6 - 7 hours after drinking it. The mint taste of the tea made me feel like drinking mint tea. 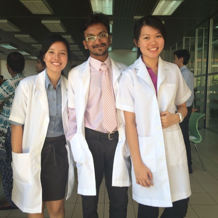 The pain was bearable the next day and after the detoxification, my body felt so 'clean'. After the detoxification on the first day, my tummy went flat right after and it felt like I lose an inch on my waist. I did not even feel hungry after the detoxification and in fact it lasted me till late lunch to feel hungry. I drank the tea almost twice a week to see the effect on my tummy. I used to have very bad constipation and after trying out this tea, I no longer need to depend on this tea to go to toilet anymore. Since this detox tea is a bit pricey for me, I only drink once a fortnight whenever I feel like going for detoxification again. Overall, I feel great and I am happy with the results as I did lose fats on my tummy. Never felt so healthy before after the detoxification. (: To those who have not tried any detoxification programme before, it's normal for you to experience some stomach discomfort. Don't worry as this symptom will reduce or disappear with regular usage. TruDtox™ Natural Herbal Cleansing Tea is now available at Watson’s, Alpha, Vitacare, Constant, Health Lane and leading pharmacies nationwide. You can also purchase it online via http://www.plincco.com. Each box comes with 15 teabags with additional free 2 teabags at RM88.50. For more info, check out http://livelife.com.my/products/trudtox/.